Although the English folk scene of the late 1960s remained fairly obscure and never attracted great numbers of fans in this country, the groups and artists who formed the foundation of the style have been remarkably durable. All three of the groups that popularized the genre, Fairport Convention, the Pentangle and Steeleye Span are still around in one form or another, even if only at occasional get-togethers. And probably the most influential individual to come out of the scene is Richard Thompson, who was about 16 years old when he and some friends got together in 1967 in a big house called Fairport to form the most popular group that combined traditional English folk influence with rock & roll instrumentation. Fairport Convention's music ranged from traditional to original to English-folk influenced versions of American rock tunes. Though the late vocalist Sandy Denny was probably the best-known member of the group at the time, and also wrote some of their material, it was Thompson who provided the bulk of the group's original music. It has been a quarter century since Thompson officially left Fairport Convention, but he and the other members have remained close, often collaborating. In the meantime, Thompson has become the epitome of the critics' favorite who never quite gets the commercial success all of his fans think he deserves. He has created a sizable body of work, including several joint albums during the late 1970s and early 1980s with his former wife Linda Thompson, that are all marked by his haunting songs that explore many a subject from love to history. After last year's uneven half-electric-half-acoustic double CD You? Me? Us?, Thompson's latest release is something they used to do back in the 1960s -- a "concept album." It's actually a co-equal joint record with the unrelated bassist Danny Thompson, called Industry, and its premise is the exploration of the transition to a post-industrial age, and the attendant demise of the old jobs and ways of life. Danny Thompson is a ubiquitous acoustic bassist whose career has crossed paths many times with Richard Thompson's. The latter joked that since Danny Thompson was in a rival band, the Pentangle, "we always had to cross the road to avoid actual contact!" They have since worked together on many a project, and Danny Thompson wrote five of the eleven pieces on Industry, all instrumentals. Though Richard Thompson has been living in California for the past several years, Industry was inspired events in England, when a friend who taught school in the town of Grimethorpe sent the songwriter accounts and newspaper clippings on the closing of the mines and colliery there that had been the center of the townspeople's lives. That provided the starting point for this collection of songs that consider work in a steel mill, labor disputes, the desolation of hopeless unemployment and the changing landscape the after the end of the industrial era. Danny Thompson creates some fascinating impressionistic instrumental compositions that alternate with Richard Thompson's insightful songs. Danny Thompson weaves together a curious blend of his jazzy acoustic bass, Richard Thompson's famously lugubrious guitar, and the brass bands that were often part of the mines and factories of England in the Industrial Revolution. In fact, Danny Thompson recruits his two uncles Albert and Harold Thompson, who did hold factory jobs and played in brass bands. The result is one of the finest albums in the career of either artist. Richard Thompson captures the mood of the era with some of the best lyrics on the subject of work to come along in a long time, while Danny Thompson captures the impressions through his sometimes eclectic compositions. Both men spent a fair amount of time researching the effort, visiting old mining and factory towns, and seeing the museums some have turned into. Joining Thompson and Thompson are another Fairport Convention stalwart drummer Dave Mattacks, Steeleye Span fiddler Peter Knight, plus Tony Roberts, who plays woodwinds and has been a guest on albums in this style going back to the late 1960s. Roberts wrote many of the interesting orchestrations. Christine Collister, who has often toured with Richard Thompson is heard doing some backup vocals. 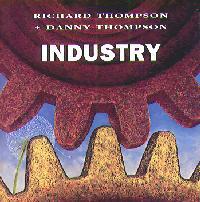 Richard Thompson and Danny Thompson's new joint album Industry is one of the best by either of the veteran British artists who both came out of the 1960s English folk scene. It's a poignant musical elegy to the demise of the mines and factories that sustained generations of workers since in the 1700s. Their lives were often harsh, but the message of the album is that the loss of those jobs can be even harsher. With Richard Thompson's considerable lyrical acumen, and Danny Thompson's fascinating musical eclecticism that draws on both his jazz background and his memories of the company brass bands in the factories, the result is one of the best collections of work songs on record in recent years, and a very significant work overall. Sonically, the album is quite respectable. It was recorded in England in the same studios and with the same engineer, Jerry Boys, who worked on some of the old Fairport Convention material. The instrumental tracks, with their dry subdued sound, are a kind of audio equivalent of an old sepia-toned photograph. The mix is certainly a huge improvement over the excessively quirky sound of Richard Thompson's last album produced by Mitchell Froom. This album was too creative and interesting to have any hope on the major label for which Richard Thompson usually records, so Industry was released by the independent Hannibal label, making it a bit harder to find. But Richard Thompson fans, and general aficionados of the English folk scene will not want to miss this memorable CD.